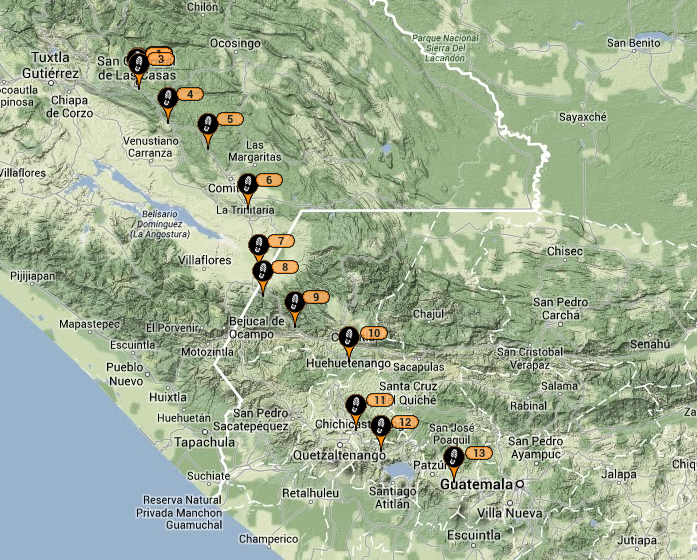 Someday Never Comes...: San Cristóbal, Zapatista Guerillas, & Border Crossings... Oh My!!! 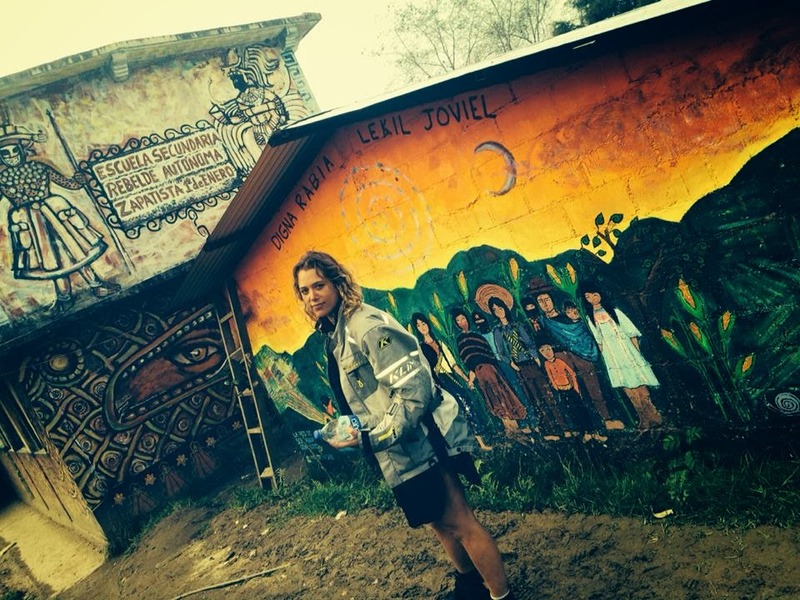 San Cristóbal, Zapatista Guerillas, & Border Crossings... Oh My!!! Well it's official, chapter 3 of the journey has begun. 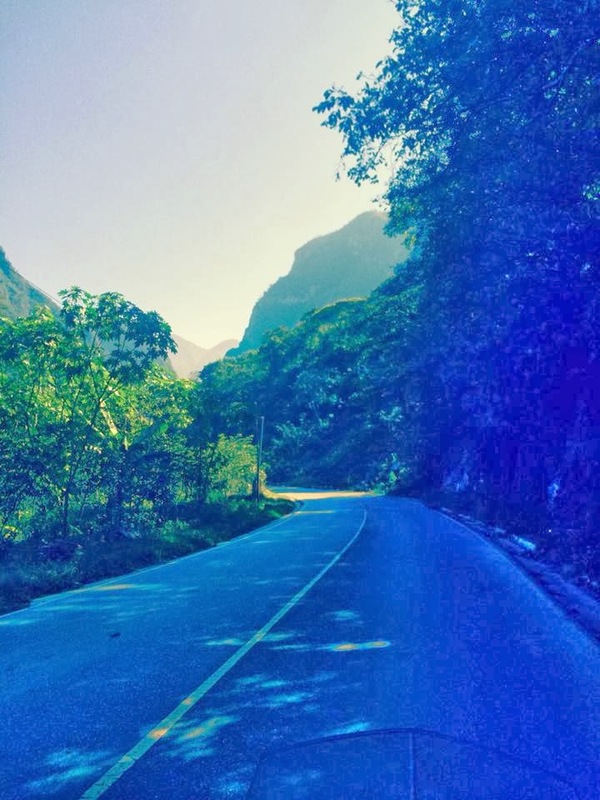 I consider the 1st chapter my time traveling through the US, chapter 2 would be the month in Mexico, and now chapter 3 will be my travels through the remainder of Central America. I was in San Cristóbal for several nights. 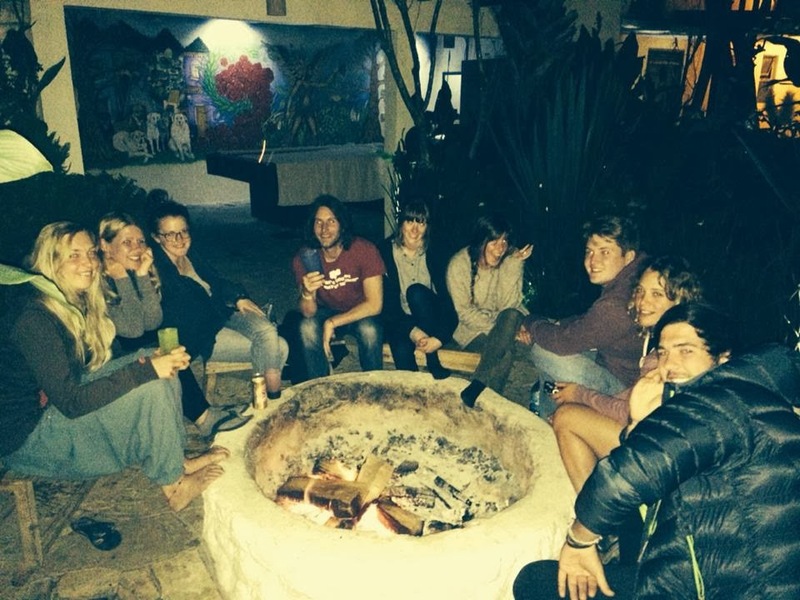 I stayed at Rossco's Backpacker Hostel, which was perfect. Good folks, beautiful architecture and gardens, comfortable bed, cheap, and with secure bike parking. I mentioned this before, but if you show up on a bike, the first night is free. Like most places I've stayed, the hostel was filled with a very eclectic mix of travelers. There was representation from Denmark, Australia, England, Korea, Mexico, and several others. I ended up hanging out with a few people from the hostel and had a great time in the city. S.C. is beautiful. It was founded in 1528 and has beautiful streets, architecture, gardens, and churches. It is fairly large with a population of a little over 150k. 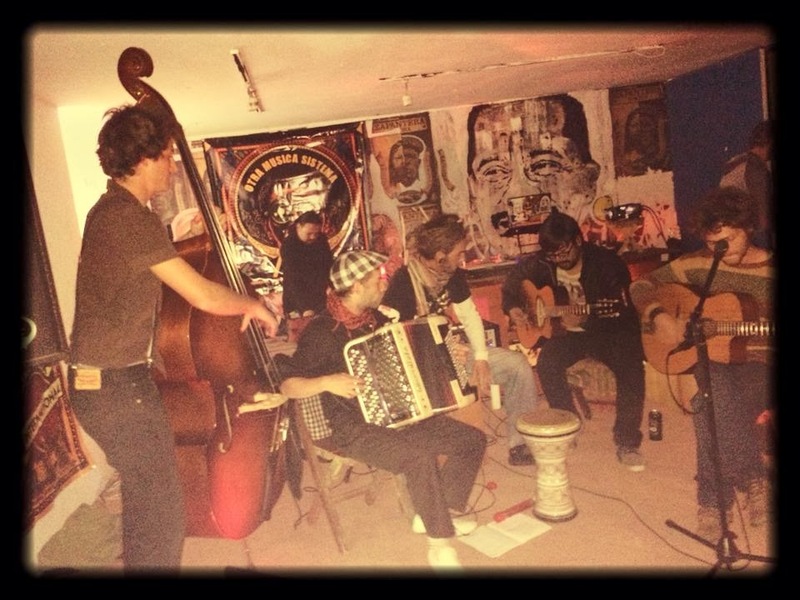 The second night I was there, I met a guy at a cafe that invited me to an underground gypsy music party. The venue, crowd, art, and music were all incredible. 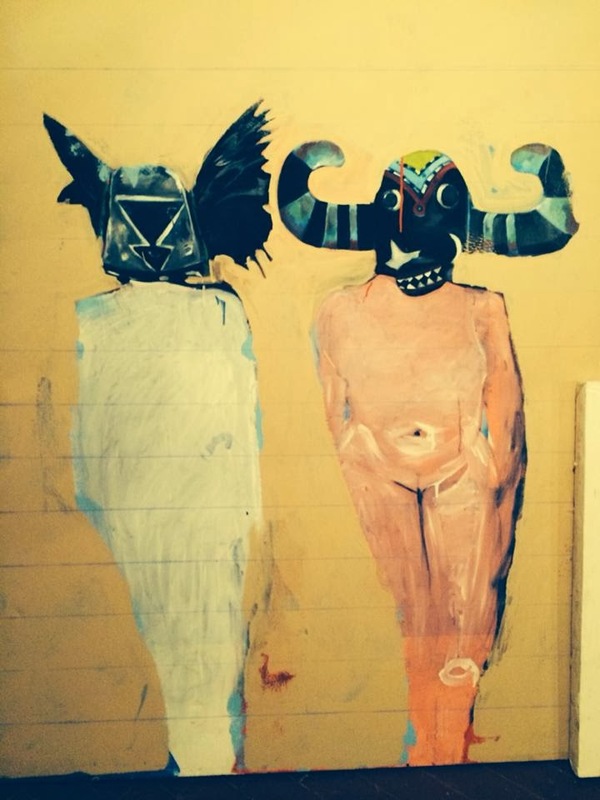 While there, I noticed that the place was very Zapatista friendly (art on the walls, graffiti in the bathrooms, etc). 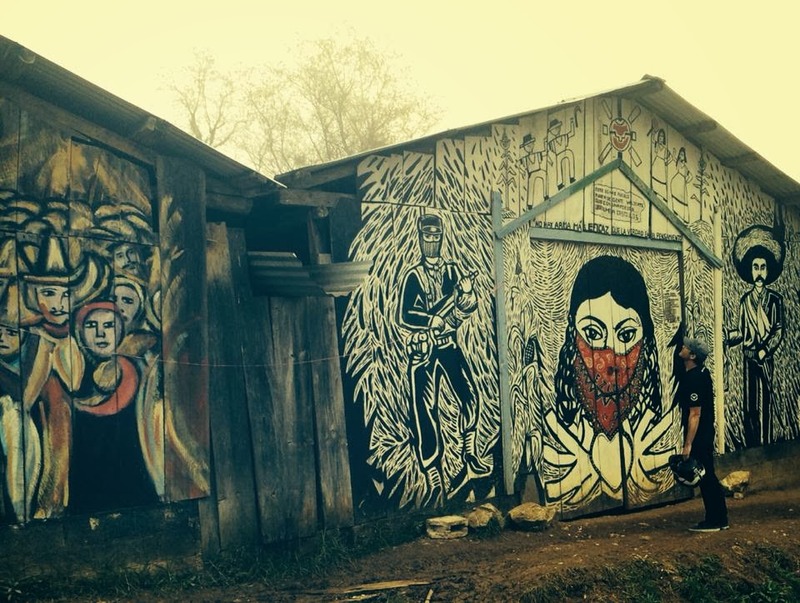 I ended up chatting with a guy who spent some time living with a Zapatista community. He said that I may not be invited in, but gave me directions to Oventic, and several tips on how to act and react. I also met Nat (short for Natalie) at the hostel and invited her along for a day trip on the bike to visit the compound. 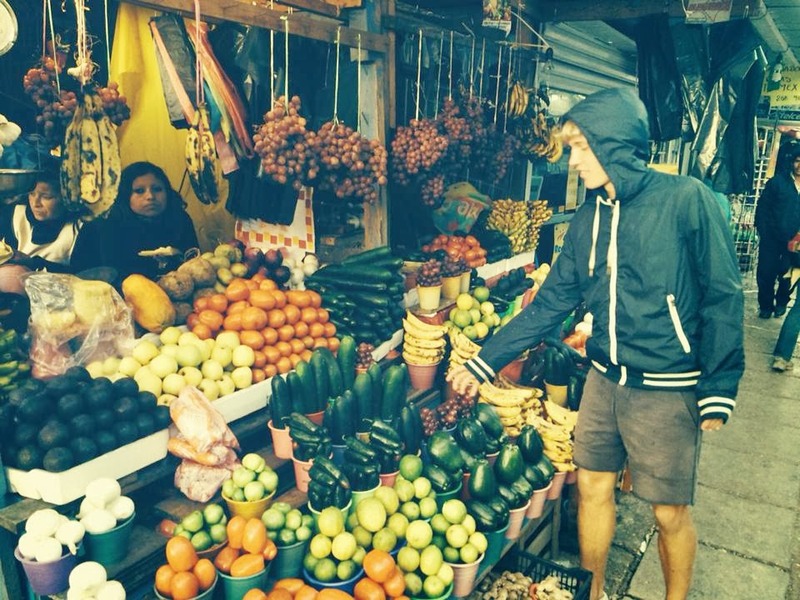 The next morning Nat and I agreed to meet at the main plaza in Chamula, which is a small village north of S.C. at 2pm. As planned, Nat strolled up and after taking in a few sights in the town (namely $hitfaced local dudes passed out everywhere - along with a beautiful plaza and church) we headed out on our adventure. The directions I was given ended up being slightly off. Nat and I ended up getting lost countless times in tiny little villages, and meandering up and down the mountain roads. We were about to give up and head back until we finally met a guy willing to give us exact directions. I get the impression that the locals aren't really supposed to give specific directions to Oventic. We crested an eery fog-covered mountain and finally arrived to Oventic around 4pm. There was only one sign and a gate. The gate was guarded by two women with red bandanas covering their faces. I parked the bike and we walked up. I asked in Spanish if it was permitted for us to enter. She said possibly and then motioned over two guys who were milling about in the background. 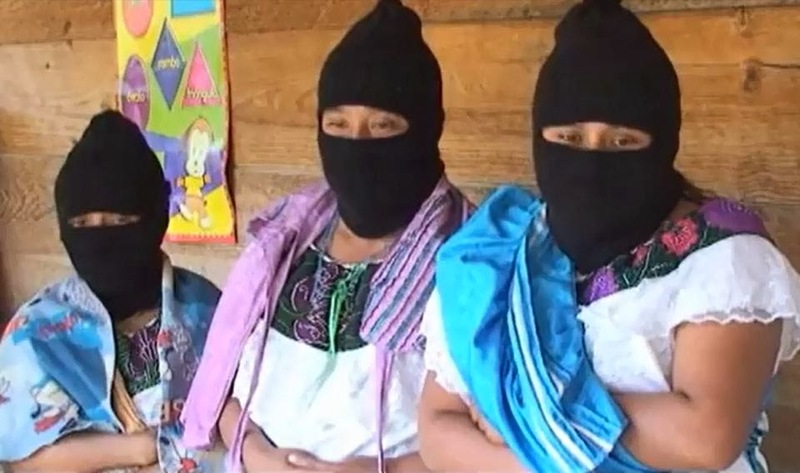 When they started coming towards us I realized they were wearing traditional Zapatista balaclavas and gear. There is something rather daunting about having masked/armed guerrillas marching towards you. They came up and asked, "why are you here?" I responded that we were there to study the murals, art, and culture. Also that we wanted to learn more about their way of living. Masked guerrilla # 1 then walked back to confer with masked guerrillas # 2 & 3. After about 20 minutes, masked guerrilla # 1 walked back over with a form and interviewed both of us about our intentions. He then asked for our passports and said they would hold them while we were inside the compound. Daunting feeling number two, watching as a masked guerrilla walks away with your passport leaving you locked outside the gate. Fortunately, I travel with an expired passport, but Nat brought her real one. She was a bit nervous about that. Long story short, after waiting for almost an hour, we were finally allowed into the community. According to our 'guide', there are approximately 2,000 members that reside in/around Oventic. As you walk down the hill from the gate there are wooden communal houses that are long and slender on the right. On the left there are several places preparing food and a communal center. A little further down there is a church on the left, and a couple of judicial buildings on the right, one of which was a 'significant women of the community' meeting place. Down the hill at the bottom of the compound is the school. Like anywhere else, they have primary and secondary school, and there were children hiding about pointing at us suspiciously and laughing at the strange gringos. 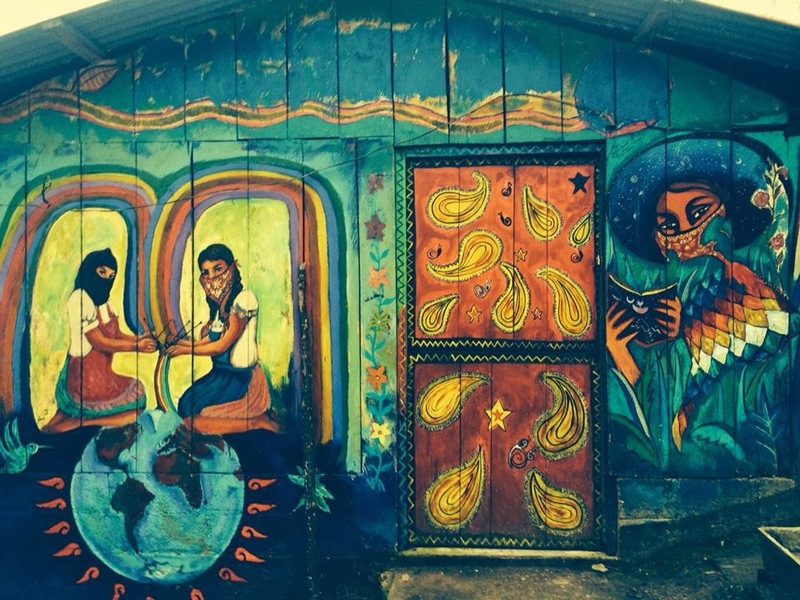 Everything, and I mean EVERYTHING is covered in beautiful painted murals. If you know me, you know I love street art, so I was in heaven. There are even a couple of original Banksy murals from time he spent with the community several years back. Of course there are tributes to the founder of the movement and several praising Che as well. Just as quick as we were led in, we were walked back up the hill and led out of the gate. Our passports were returned with a handshake and a "thanks for visiting and learning more about us". It really was a highlight of the trip thus far. 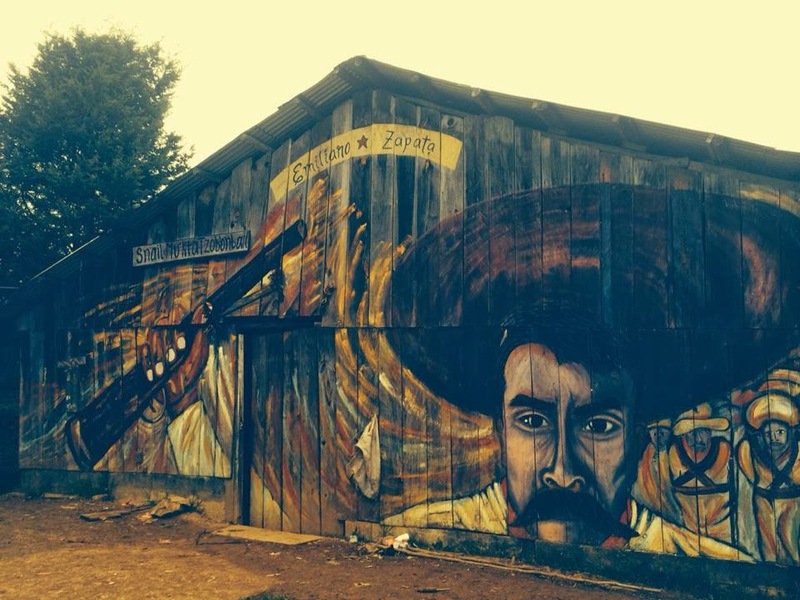 I got to learn more about the EZLN and Zapatista culture than I ever thought possible. It seemed surreal that I was actually inside their community. It was a special day for sure. Not including the US portion of the trip, I've now been on the road for over one month, and have clocked over 5,000 miles of travel. I've had one incident with a flat battery, and one tire puncture. I stopped at numerous amazing locations in Mexico ranging from snowcapped mountains, scrub and cactus covered desert, pristine coast, and colonial cities. I've watched countless amazing sunsets (only one sunrise unfortunately). I watched 'The Secret Life of Walter Mitty' in a theater in Morelia and realized how extraordinary it is that I'm already chasing down dreams of grand adventure (the theme of the movie). I've met a great deal of friends during my travels, and also several beautiful girls that caught my attention, one of which I can't seem to shake away the thought of. I've been scared, at times depressed and lonely, incredibly happy, excited, anxious, and everything in between. All that and I lust for more, more, more! Today I began Spanish classes here in Antigua. I plan to study for 3 - 5 days depending on how the lessons move along. Today went very well, and even though my instructor Rosa speaks zero English, we were able to communicate just fine. I think I'll also take a short tour to see some lava one of the days (apparently you get so close you can roast marshmallows). I also met the owner of MotoTours (formerly CATours) today. Jose is a great guy, and really loves his bikes. He is a fan of roadracing as well, so we got along just fine. 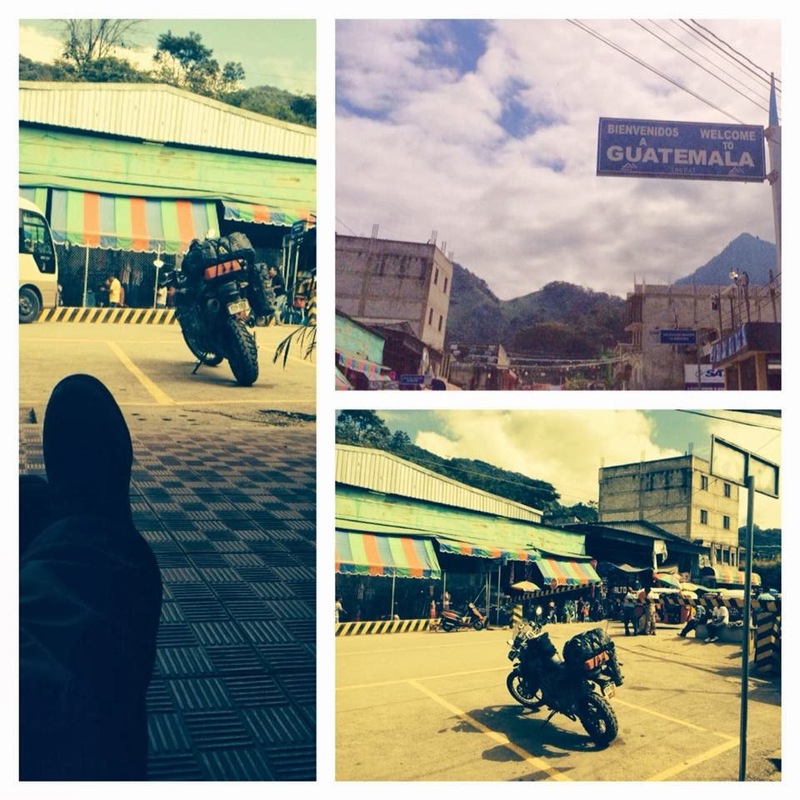 I had no idea racing was such a big deal in Guatemala. Anyway, Jose invited me for a ride, so I'll probably take him up on it while I'm here. He has a nice selection of 250's and 450's to rip around on. Check out his site here. That's all for now. I'm meeting up with my first fellow ADV member tonight ('cmkaduce') for a drink. 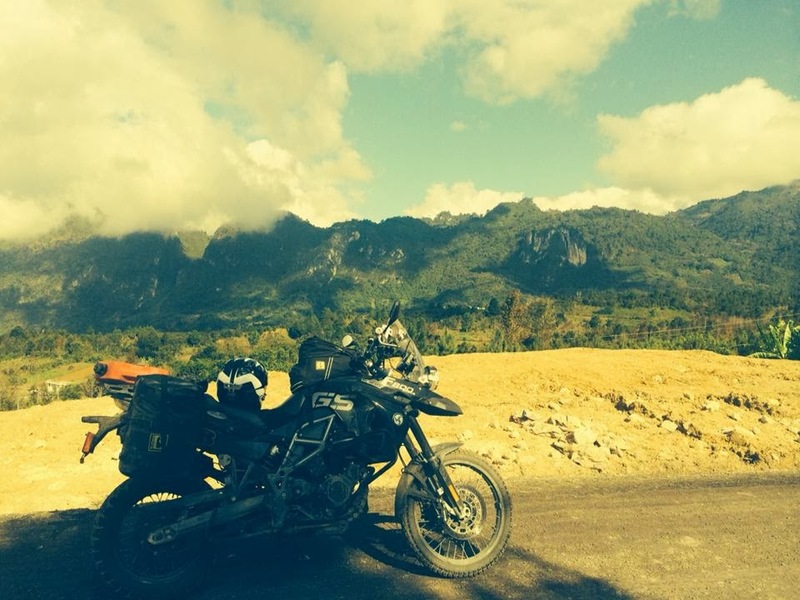 It will be great to swap tales from the road over a cold beer or two. After that I've been invited to a salsa night at a club nearby. I'm not very good at Spanish (for now), but it turns out being married to a Colombiana and the lessons have paid off. I'm pretty good at salsa. I love the reaction that I get from the local girls when they realize I'm one of the few gringos that can dance. Ahhhh, the universal language of dance.